Knife Art Invitational knifemaker S.R. 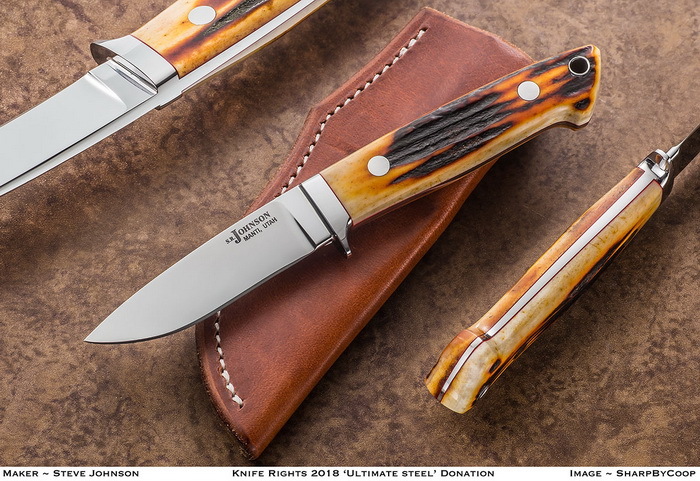 "Steve" Johnson has crafted for us one of his Baby Dropped Hunters featuring his signature mirror polished 154CM stainless blade, 3 inches long. Full tapered tang construction with a stainless guard, smooth Stag scales and a lanyard hole. Comes with a leather sheath by Nate Christensen. I started making knives in 1965 with Gil Hibben. My first knife was completed in March, 1966. I worked for Draper knives, Ephraim, Utah, Davis Knives, Spokane, Washington and R. W. Loveless, Lawndale and Riverside, California, in the early 1970’s. Started full-time on my own in 1975 after leaving California in October 1974. I make hunters, fighters, most of them Loveless-style. Born and raised in Manti, Utah.